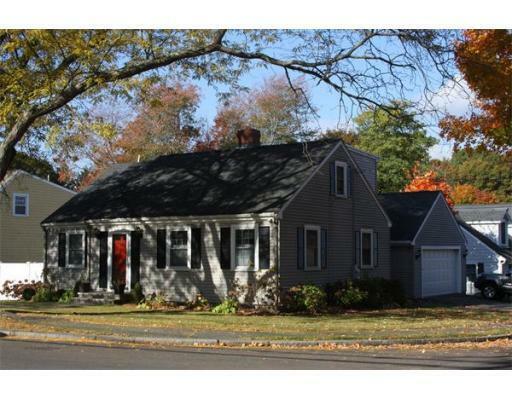 This charming Expanded New England Cape is warm, inviting and in pristine condition. Offering features an upgraded kitchen with granite counter-tops, which is open to a nice size dining space. Just off the kitchen is a large livingroom with hardwood floors and a beautiful fireplace. The many updates are accented with traditional details like hardwood floors, fireplace, first floor master bedroom and an extra room perfect for a home office or a fourth bedroom. The basement boasts a nice sized finished family room, a laundry room and plenty of space for storage. The 2 car garage is attached with access directly into the mudroom which connects off the Kitchen out onto a spacious deck and fenced in yard. Don't miss this lovely, turn-key home.